What does the first part mean? If it's the exact time, shouldn't it be 19:45? And if it's duration, shouldn't it be "After 19.45 hours"? The Sirius Crossing by John Creed. The author is Irish and the text is set in northern England/Ireland. There seems to be several elements in the original text that are confusing. The dot in the time notation is not a decimal point, as in "19 point 45", as in 45 hundredths of an hour. It's an alternative to the colon as the time separator and would be pronounced "nineteen forty five hours". There are a variety of names for the "dot" symbol, but this one would be a "full stop" or a "period". Both terms are equivalent and are used in Commonwealth English and American English respectively. Many languages use a dot as a separator between hours, minutes and seconds. In Germany, it was the standard notation up until 1996 and is still commonly seen. The German standard DIN 5008, which specifies typographical rules for German texts written on typewriters, was updated in 1996-05. The old German numeric date notations DD.MM.YYYY and DD.MM.YY have been replaced by the ISO date notations YYYY-MM-DD and YY-MM-DD. Similarly, the old German time notations hh.mm and hh.mm.ss have been replaced by the ISO notations hh:mm and hh:mm:ss. Those new notations are now also mentioned in the latest edition of the Duden. The German alphanumeric date notation continues to be for example “3. August 1994” or “3. Aug. 1994”. 1am, 6.30pm, etc; 10 o’clock last night but 10pm yesterday; half past two, a quarter to three, 10 to 11, etc; 2hr 5min 6sec, etc; for 24-hour clock, 00.47, 23.59; noon, midnight (not 12 noon, 12 midnight or 12am, 12pm). Since the dot serves the same purpose as a colon, the time is meant to be 7 hours after noon (midday), plus 45 minutes. Some cultures do not commonly use the 24-hour clock and a number higher than 12 in a time might be unusual. The 24-hour clock is the most common system in the world today and counts the number of hours passed since midnight, from 0 to 23. It is also called "military time" in the United States. Therefore, "19" means "19 hours after midnight". [As for] whether you should say “hours” after giving the time, that somewhat varies by what branch of the military you’re dealing with. If Soldiers and Airmen are saying 2:00pm, they’re a little more likely to give it to you as “fourteen hundred hours,” while Marines or Coast Guardsman [sic] are a little more likely to render it [as] just “fourteen hundred.” Across the branches though, it’s typical to drop the “hours” bit when you’re talking face-to-face and your meaning is obvious, only adding it in conversation and written communication that’s more formal and where you want to make sure the message is clear. It would appear that the author wanted to add some military slang since the story happened at an airbase. The phrase "at approximately 19.45" seems unusual for some people who would rather see "about", "roughly" or "around". However, "approximately" reinforces the formality of the sentence, as it is something you might find in reports, legal settings or scientific documents. It sounds much more technical than "around" and again fits with a military setting. Time and date notations are notoriously difficult to get right. The sum of all the culture-specific quirks (also including number formatting, sorting, case conversions, etc.) is called a locale in computer science. There are as many locales as there are countries and languages. In fact, the "same" language in different countries might have different notations. For example, in Canada, English and French are the two official languages and have different date notations (dd/mm/yy and yyyy-mm-dd respectively). Canadian English and British English also have different time notations (12-hour clock and 24-hour clock respectively). a result of outside influences, because another country close by is using a different notation. In this case, the dot is not the official notation in either Ireland or the United Kingdom. It is, however, a popular notation in the UK. 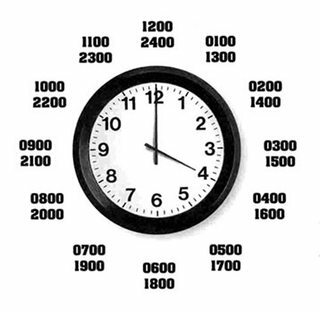 The time being used here is military time - a means of telling the time based on a 24 hour clock, and is used to avoid confusion between a.m. and p.m. hours. The military also add a time zone indicator (A-Z) to denote the correct time zone. "Nineteen forty-five" hours means 7:45 p.m., or quarter to eight in the evening, in common parlance. It's often used in movies and literature to enforce the point that a character is from a military background, or the story takes place in a military setting. Considering the context, I would say that 19.45 hours refers to 7:45 PM, because the sentence states that something happened at that time. I have to say though that the use of a decimal point as a separator for the hour and minute portions is nonstandard (as far as ISO 8601, a document that is considered a standard for representing dates and times, is concerned), and thus the source of your confusion. However, a more definitive answer would require more of the material that precedes and follows the quoted section. If the writer means "at", then it's "at", not "after". Though at implies a certain point in time, the time doesn't have to be "exact". In this case, the writer may not want to or may not be able to locate an exact point in time, but it's around 19:45 (or nineteen-forty-five (hours) in military speak). Rephrasing it with after would change the meaning. "At approximately 19.45 hours the two men rose, stretched and yawned." in a military setting (which is the case in this novel) should not be ambiguous to an average reader at all. It's true that "19.45 hours" might mean 19 hours and 45 minutes long, or maybe 19 hours and 27 minutes (45/100 of one hour) long elsewhere. (See the ambiguity if we try to read it as a duration?) But it doesn't make sense to try to read it so in a military context, because in this register, clarity is of highly important. So, even to an average reader who might not be familiar with this "19.45 hours" notation, it's only reasonable to read this as 19:45 (or 7:45 p.m.). 19.45 hours is just the formal British/Commonwealth way of saying the time was 1945 or 07:45pm. Pronounced "Nineteen Forty-Five Hours", it's usually used in police reports, military accounts and legal representations; anything where a more formal way of speaking is considered the norm (normal). I don't think this way of speaking was ever prevalent in America but in Britain it represents, at least in some sense, the slightly more hierarchical way of addressing people. I would never say to a friend let's meet at 19.45 hours but I would say it in the Army. I have the impression it would just be the same in the US. In written German, time is expressed practically exclusively in the 24-hour notation (00:00–23:59), using either a colon or a dot on the line as the separators between hours, minutes and seconds. Example: 19:45 or 19.45. The standard separator in Germany was the dot (DIN 1355, DIN 5008) until 1995, when the standards changed it to be the colon, in the interest of compatibility with ISO 8601. You can also visit the following link to find more about this topic. Put simply, that would be 19 hours and 45 minutes into the day. The day starting at 00:00 and 12:00 being noon, or midday. In this case, the time that's given almost certainly indicates the time at which the described actions began. That is, they stood up at about 19.45 (7:45 PM, if you prefer) and the rest of the action followed, so it might have been, say, 19.50 by the time they were actually standing at the door. Not the answer you're looking for? Browse other questions tagged phrase-meaning time or ask your own question. Can I describe the time like “eleven thirty hours”? What exactly does “doing something for the xth time in y hours” mean?